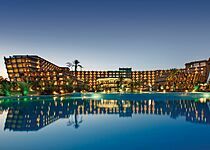 7 Nights from £649 inc Flights, Hotel & VIP Transfers - £279 OFF! 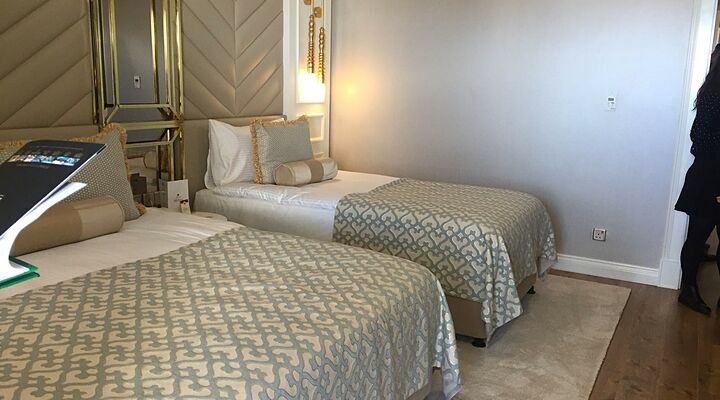 Inspired by the legend of the Phoenix, who rises reborn from its own ashes, the Limak Cyprus Deluxe Hotel aims to refresh and rejuvenate its guests and fire them with energy for their return home! 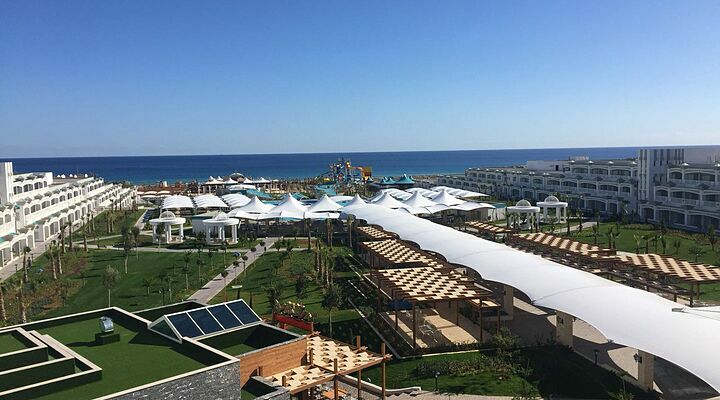 The 5 star luxury Limak Cyprus is certainly an awe-inspiring sight, a steeped design in pastel blues and whites that perfectly mirror the waters of Famagusta Bay. Centred on an infinity style swimming pool, the design is modern and fresh, yet with a distinctly Mediterranean feel. 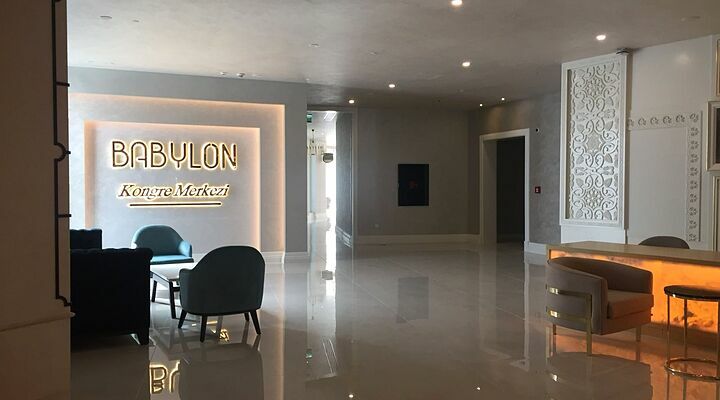 Situated on the southern coast of the Karpaz Peninsula, Limak Cyprus Deluxe Hotel is located in Bafra, part of a new generation of luxury hotels in this beautiful part of Cyprus. 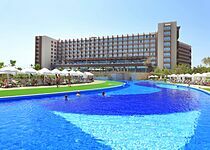 The large infinity style swimming pool at the Limak Cyprus is at the centre of its horseshoe shaped buildings. And what a pool it is! 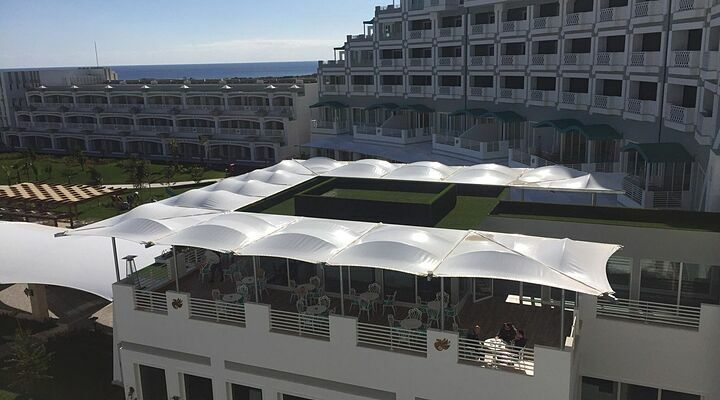 Surrounded by large sun terraces shaded with elegant white awnings, and with two covered pavilions over the pool itself, you can spend all day here with ease. 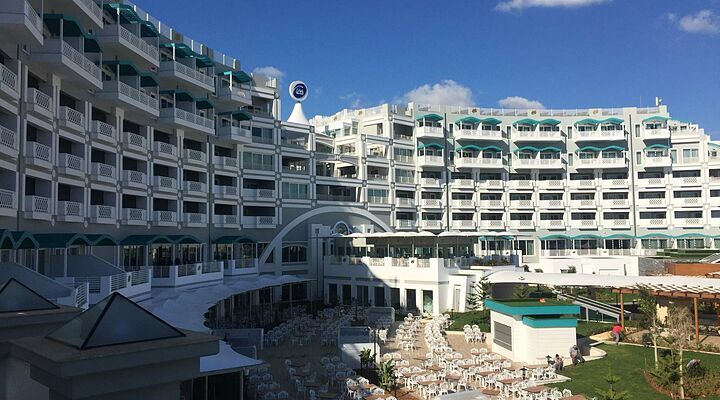 Wander down across the lawns from your room, and plan your day of serious relaxing to include a light lunch and a cooling drink from the Atlantis snack bar. Swim to the central island where you can enjoy the sun before swimming back to your shady sun lounger - you don’t want to overexert yourself, after all! 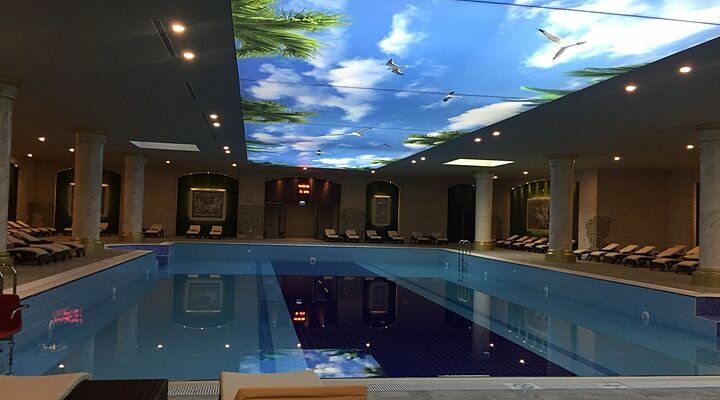 The Limak Cyprus inside swimming pool is an oasis of calm, where the open sky painted on the ceiling reflects in the crystal-clear water below. Here you can relax in a classical-themed hall, complete with comfortable loungers and a small plunge pool. The Limak Cyprus sits right on the beachfront, so it’s just a short stroll from your hotel room to soft sandy seashore, via shady walks and waving palms. It’s a wonderful beach just to swim, sunbathe or join in a game of beach volleyball - the choice is yours! 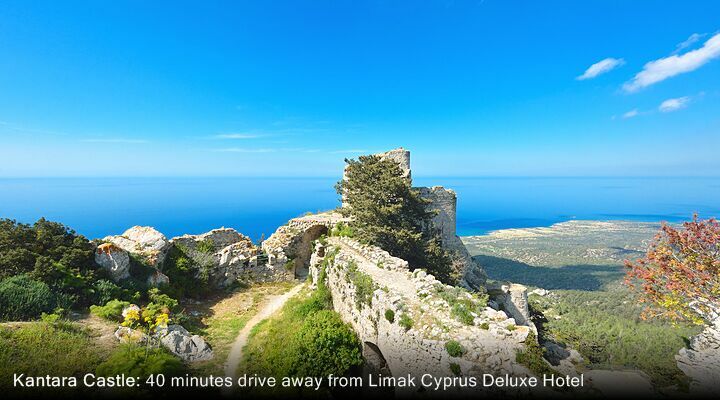 Book a luxury Cyprus 5 star holiday at Limak Cyprus Deluxe Hotel with Go North Cyprus. Call us and ask us any question on 0800 612 6600. 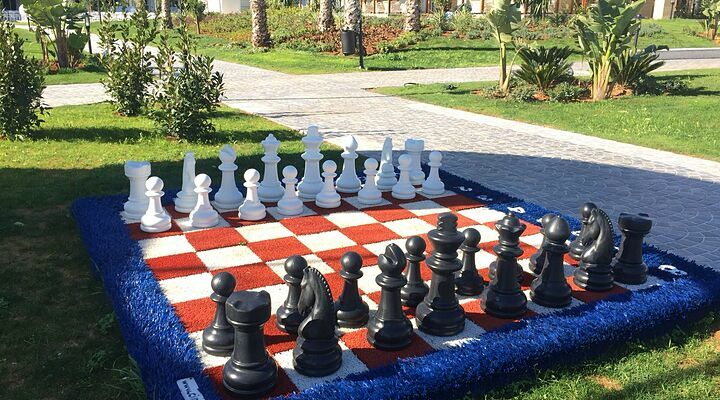 We're based here in North Cyprus and we visit the hotels in person, so we have inside information to share! 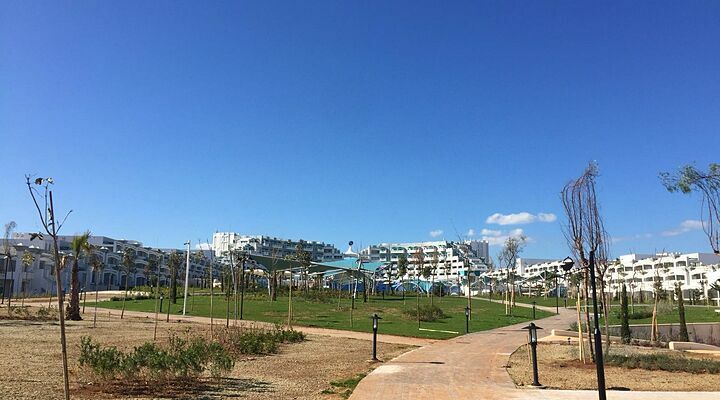 The Aquapark is a riot of colour that sits right on the edge of the sea. Kids of all ages will adore riding the tunnels and flumes, before catching their breath in the shade of the trees below. The popular Kids Club is ideal for younger children, where they can enjoy games, activities and crafts under expert supervision. Older kids can hang out in their own play hall complete with snooker tables, air hockey and video games. 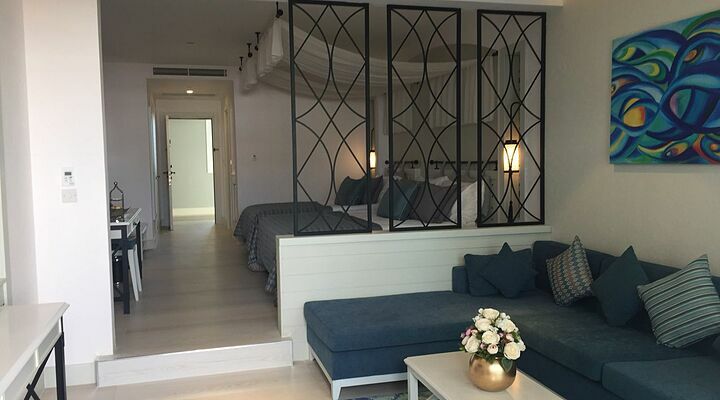 The rooms at the Limak Cyprus are elegant, light and furnished with luxurious touches. 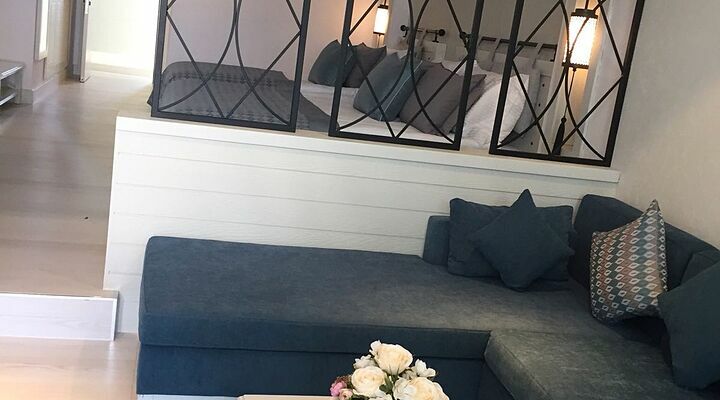 Expect cool wooden floors and golden accessories in a Standard room, light and airy Mediterranean styling in the Family Suites, and the space and feel of an apartment in the opulent Suite Rooms. You really are spoilt for choice when it comes to dining and drinking at the Limak Cyprus hotel. Enjoy the open buffet in the main Limra Restaurant, combining tasty Turkish dishes with world cuisine. Enjoy ‘anytime’ food or drink from the Atlantis Snack Bar, or treat yourself to a deliciously indulgent cake or pastry from La Patisserie. The hotel also boasts three a la carte restaurants. Tuck into the fresh tastes of Italy in the Arcadia Italian Restaurant, or the excitement and showmanship of Teppenyaki cuisine in the Dynasty Far East Restaurant. During the summer months, enjoy authentic Anatolian cuisine with a view across the sea at the Mysia Open Grill Restaurant. The Limak Cyprus boats sit own theatre space where you can enjoy themed shows, and a small nightclub where you can dance the night away. With a full summer entertainment programme including live music and shows, there’s always something going on! Every detail has been thought out at this atmospheric spa. 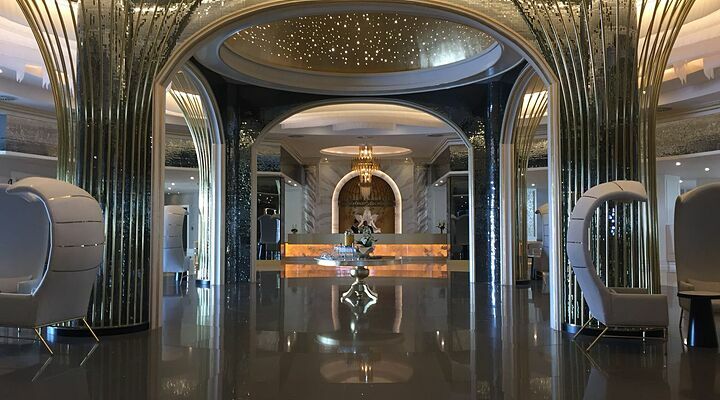 From the moment you wander into the reception area with its Persian-style frescoes and marbled floor, you leave the bustle of everyday life behind. Massage beds nestle in their own curtained alcoves with relaxing sunset images and matching towels. Curved day beds sit beside an atrium and tree, perfect for chilling out with a book. The steam room is a funky mix of white tiles with dots of colour, the sauna is a spacious cabin of natural wood, while the Turkish hammam is beautifully styled with striped marbles and traditional designs. 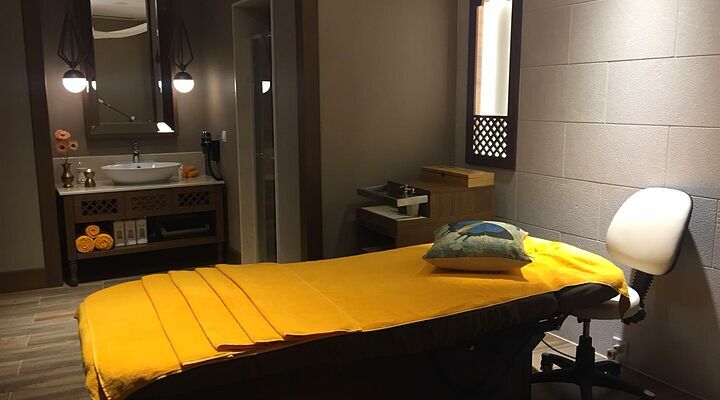 There’s also a fitness centre, Vitamin Bar and an impressive range of beauty treatments to choose from. 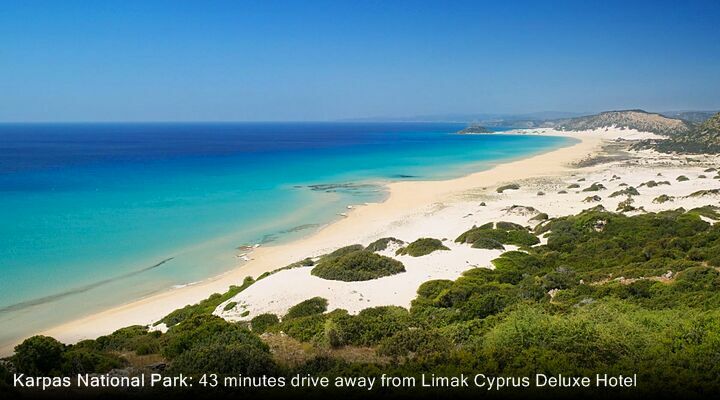 Fly to North Cyprus with Go North Cyprus and choose from selected UK London and regional airports. Every GNC North Cyprus package holidays include a private taxi transfer, and short transfer times to Bafra of about 45 minutes.